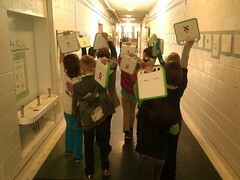 XO laptops for American kids, yeah! Well, wait - that’s not exactly who they were meant for…So why would it be OK - and maybe even a really good thing - that I had a 1:1 XO laptop third grade classroom in Seattle last year? Here's my answer. A very brief history: I bought an XO in 2007 in the first G1G1 (Give one Get one). I wasn’t exactly an evangelist for the XO program, far from it in fact. I just believed this was something that would be great for my third graders to try out. I tried to get funding from my school’s PTSA, but no dice. In the end, I just took a leap and went for it – a leap of faith that I would find myself repeating several times over the next few years. Fast forward to the end of the 2010-11 school year. There is now an XO Laptop Lending Library at my school. There are 29 XO’s in that library, including the one I bought way back when. The rest, every single one, have been donated to my classroom. If you’re interested in that part of the story, I’ve told it here. I began the lending library with my own classroom, since they were already familiar with the XO. I offered the possibility of checking out an XO laptop for the weekend, something I had tried at the end of the previous school year. Next, I extended the invitation to the school’s other third grade classroom, which I already knew pretty well, seeing them for Art twice a week, and having a few in my reading group. To introduce them to the XO, I devoted a couple of Art class times. 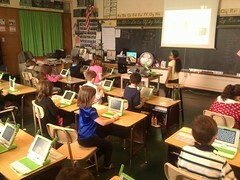 The first session included the basics of button operation, the mouse, XO vocabulary, etc. - with time to explore of course. The second session briefly reviewed the previous session, and then quickly went into Gnome (ver. 10.1.3), and back - with time to explore at the end. There was just never enough time for the exploration.... After those two sessions I figured the kids were ready to check out an XO for the weekend. Their class would be able to check out XO’s for the next two weekends, a maximum of 12 each weekend. This then was the model that I held to for the three second grade classrooms which followed. The challenge with them was finding times when I could see them for the introductory lessons - when I was not teaching. We settled on my lunchtime :( My own class was at lunch/recess during this time, so the room and I were available. The kids would come in to my classroom, where I already had the XO’s out for them on desks. I should mention that I used an XO hooked up to a projector via a special adaptor, which made those lessons much more efficient and meaningful for the kids. If this seems like an awful lot futzing around and extra work - well, yes, it was. Pick up Friday afternoon and check in the following Monday morning were usually pretty hectic, especially as I was teaching my own classroom at the same time - XO’s, power adapters, kids, clipboard, final reminders, etc. 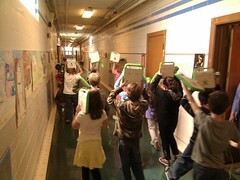 But, thanks to the cooperation of my own third graders, we were able to muddle through. I started the Lending Library in February, and we ended in June, 2011. 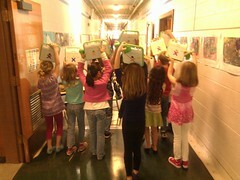 Each student from the 2-third and 3-second grades at my school had an opportunity to check out an XO for the weekend. XO laptops went home 117 times for the weekend, and 117 times they came back, just fine. That’s it. Next year I’ll start earlier and give opportunities to all the third, second and first graders. If there’s time at the end of the year, I’ll extend the opportunity to fourth and fifth grades - and maybe even kindergarten. I’ll also talk with staff about checking out our XO cart to roll into other classrooms for a week or so at a time. We shall see. 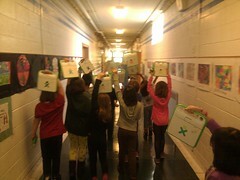 To all those who donated their XO’s to my classroom, many, many thanks! Your XO’s are providing learning, exploration, and play opportunities for an entire school community. Thanks for sharing your idea, and for continuing to document your XO journey. My own journey seems to have gotten sidetracked.